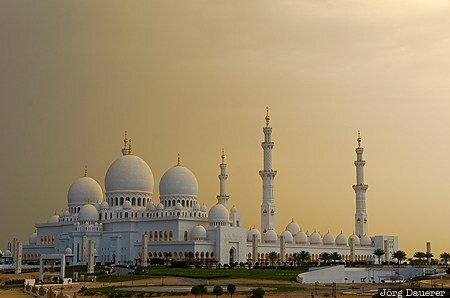 The Sheikh Zayed Grand Mosque in Abu Dhabi, which is the third biggest mosque in the world, in front of a cloudy colorful morning sky. Abu Dhabi is the capital of the Emirate of Abu Dhabi in the United Arab Emirates (UAE). This photo was taken in the morning of a cloudy day in March of 2012. This photo is part of the exhibition Colorful Sunrise (October 2013). This photo was the image of the month in July of 2016. This photo was taken with a digital camera.